Nobody wants to smile and unleash a mouthful of missing teeth. If you have multiple missing teeth or damaged teeth that need to be pulled, it is important to get replacement teeth as soon as possible. These replacement teeth are not only for aesthetic purposes, as gaps in your teeth can lead to a litany of other health issues. That is why it is essential to address gaps in your teeth with a dental bridge. A dental bridge allows you to have fully functional and realistic looking permanent replacement teeth, so you can smile with confidence again. University Dental in San Diego specializes in installing dental bridges, so to learn more about dental bridges read on or give us a call at (619) 582-4224. A dental bridge is a permanent dental implant that spans two or more teeth. If you are only missing one tooth, your dentist will suggest a dental implant, but if you are missing multiple teeth the best practice is a dental bridge. A dental bridge allows you to have a full and complete set of teeth, leading to an upswing in self-confidence and smiles. However, beyond looking great a dental bridge can prevent other issues from occurring. Individuals with large gaps in their teeth are at risk of their teeth shifting to try to cover the missing space, leading to a misshaped set of teeth. These shifting teeth can also cause considerable discomfort, as well as the possibility of infection or other damage. Finally, a dental bridge will allow you to eat most foods without restriction, allowing you to lead a normal and happy life. The benefits of a dental bridge are clear, so if you are missing teeth contact your dentist today. A dental bridge is a mechanism that fastens new replacement teeth into your mouth, using the surrounding teeth as anchors for the bridge. 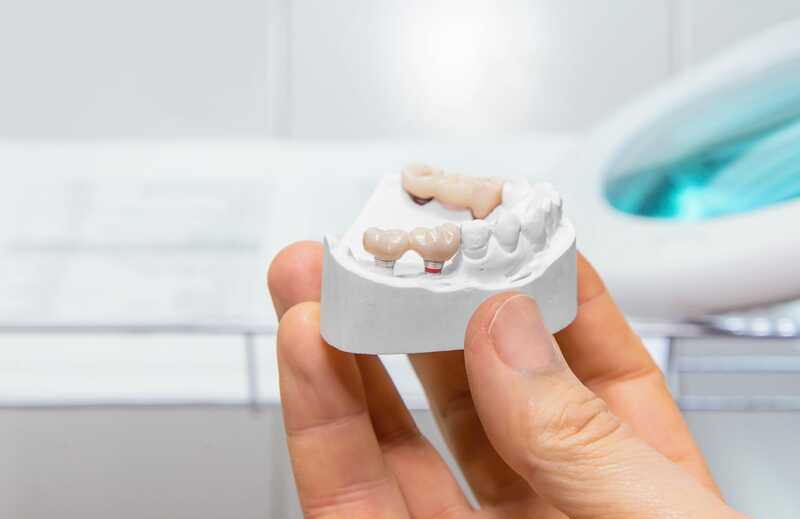 Traditional bridges are made out of either porcelain or ceramic fused to metal with crowns fastened to the top, allowing for teeth so realistic looking there will be no discernable difference to the naked eye. The bridge should be permanent, and the crowns placed on top of the bridge should last about a decade. You should treat the crowns attached to the bridge as you would any other teeth, brushing and flossing them regularly. There are some slightly different flossing techniques, but nothing too drastic or difficult to learn. However, once you have a bridge placed it is essential to take your dental hygiene to the next level. If the teeth surrounding the bridge have any structural integrity issues, the whole bridge can fail and a new bridge will have to be installed.